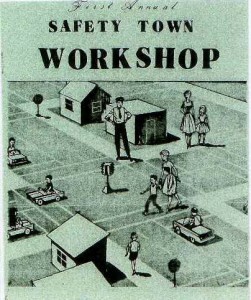 The major function of this workshop is to share materials and ideas especially to assist and guide Safety Town personnel. Only in this manner can we utilize every potential in preparing and presenting a high degree of safety education standards to our children through the Safety Town. All aspects of this workshop have been planned to stimulate thinking, excite the imagination and expand the horizons of all who attend. This is essential since we are working with and educating young children who do have much imagination and energy. We want – everyone – attending to become actively involved in this workshop. I hope each participant will return to their program and community with a sense of renewal – and – an even greater feeling of dedication toward the tasks of safety education in leadership, guidance and teaching. This was the FIRST one day (8-hour) workshop ever held anywhere in the world specifically for preschool-early childhood safety education. 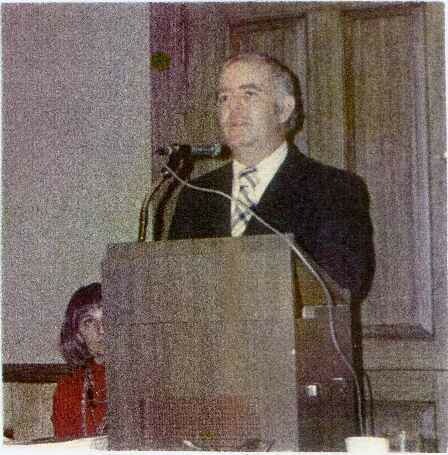 It was organized and conducted by – Dorothy Chlad – at the Marriott Hotel on May 19, 1971 in Cleveland Ohio. Over 150 people attended from several states. Safety Town personnel from 26 communities within North Eastern Ohio – actively participated in presentations and demonstrations. As a result – attendees went back to their respective states and communities and began promoting – the importance of preschool-early childhood safety education in their schools, communities and organizations. Teachers and uniformed personnel must achieve their planned objectives. Children should show achievement before new rules are introduced. Children should understand and know what isexpected of them. Transfer purpose to proper language. Allow sufficient time for self-participation. She constantly explained – proper and effective teaching methods – at every workshop, meeting, presentation and interview. Her goal was to set the standard for the highest degree of safety education. From 1963-2008 Dorothy Chlad has given over 2000 workshops, seminars, training sessions, presentations to education, corporate,civic, media, government organizations at the local, state and national / international level. The majority were conducted during 1971-1991 mainly as a result of the workshops (later called seminars) and involving the media in the workshops to explain how to prepare PSA’s and articles. Guest Speaker Franklin Haering Ph. 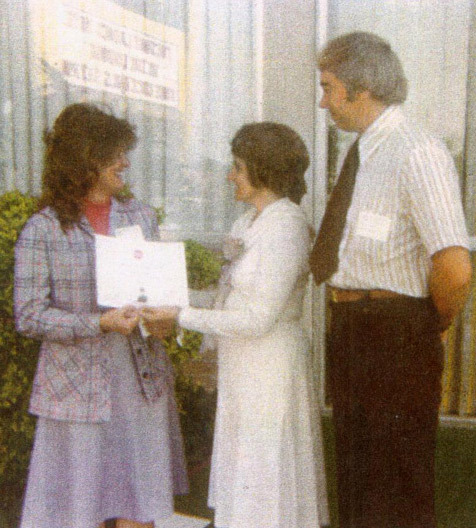 D.
Upon completion of every workshop or seminar, Dorothy Chlad presented every person a Certificate of Attendance. Here Connie Sousa State Department of Highway Safety, AZ 1977 receives her certificate while, Bob Haie, waits to receive his. 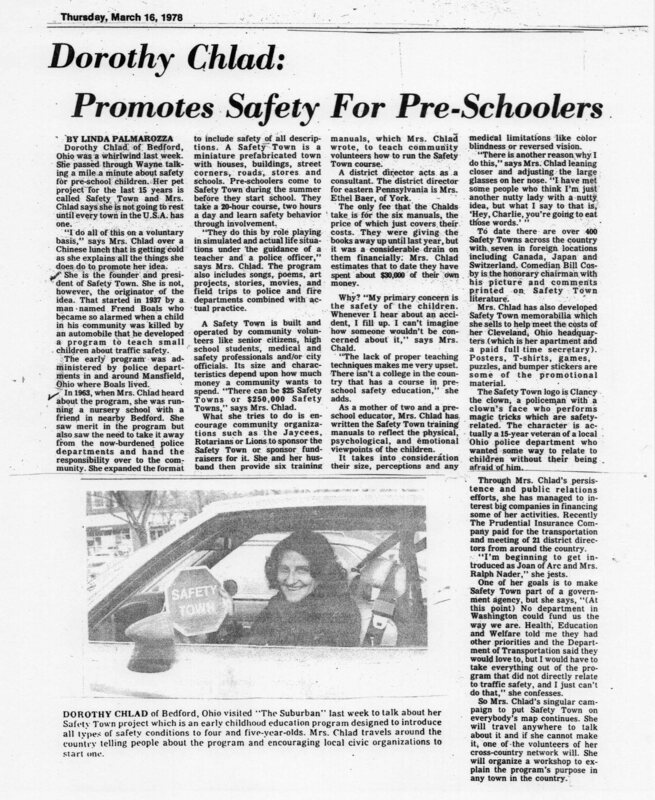 In 1974, Connie was the first to receive the second edition of the Safety Town Packet which she used to organize 20, 1 hour courses, Safety Town programs at various shopping malls throughout the state. Great job Connie! During her volunteer travels to local communities throughout the country – she would make a deal – she would make a presentation and assist them BUT they in turn had to promise to set up a Safety Town in a nearby community. At each workshop, seminar, meeting the respective coordinators are involved in organizing and conducting the event. These outstanding, dedicated people volunteered their time and money to travel to local and state events to promote – SAFETY FOR KIDS! COORDINATORS – STAND UP AND TAKE A WELL – DESERVED BOW! 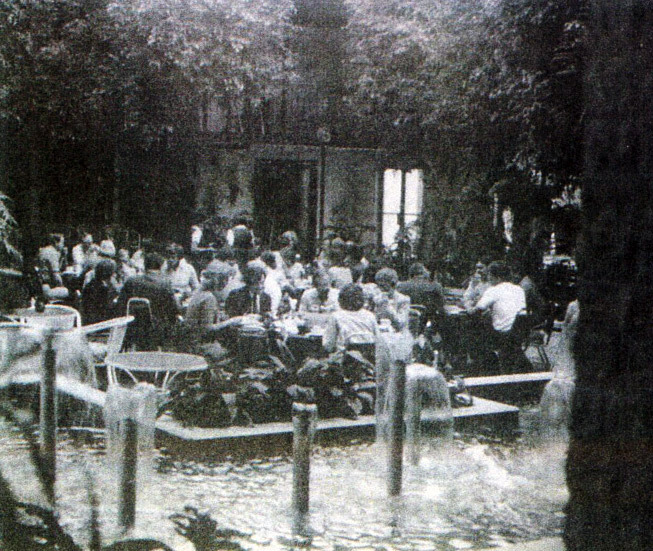 Refer to Coordinator’s Tab. YOU HAVE BEEN A MAJOR FACTOR IN THE SUCCESS OF SAFETY TOWN AND NATIONAL SAFETY TOWN CENTER! 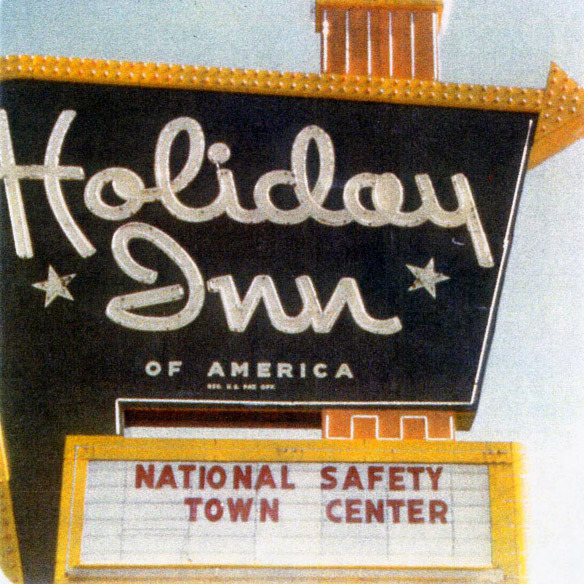 Indianapolis, IN was the home for this 8-hour seminar in 1978.Thanks to all the Holiday Inns who displayed our organizations’s name in lights. What great publicity for all to see. Thank you so much for the Safety Town Packet. We can see a lot of time and effort has gone into it. You always have a way of renewing enthusiasm for Safety Town. Thank you for your help and encouragement. I feel a two or three day seminar would be extremely beneficial. It would give more time for in-depth discussions and possibly some classes, educating us in specific areas. Involving parents in the daily classes helps us become more familiar with the progress and safety aspects and helps us to teach the children effectively. I have attended three of your seminars – you outdid yourself on this one. It was great and very informative. Well organized.Great learning experience. Safety Town is a great program. We owe this program to our youth. It is the best workshop I have ever attended. Just keep up the good work! Many thanks! An excellent workshop. Dorothy Chlad really knows the area of child safety. Few people know how to relate to small children. I feel that everyone should have an opportunity to attend a workshop. Many times we tend to lecture rather than giving the child an opportunity to participate in the learning experience. I have learned a lot at the workshop. I plan to get all the materials and work more with our schools. As an elementary school principal in the suburbs of Chicago. I am very interested in receiving all information available. I have heard nothing but extremely positive comments from various people who have been associated with the Wilmette Safety Town program and look forward to implementing it at Willowbrook School. It’s well conducted, all-inclusive and informative. You are a well-informed lady and I am very impressed with your enthusiasm and professionalism. Really, really enjoyed your whole presentation last Tuesday in Portland. I can’t remember when I have totally agreed with a speaker – I did with you. You are one sharp lady and a crackerjack educator. Unless they ride me out on a rail, we will be opening a Safety Town in Grants Pass next year! Absolutely fantastic! I was apprehensive about spending a whole day at a workshop. I sure am glad I came! At no time was I bored or uninterested. You are very well prepared and have all resources at your fingertips. You have an excellent program which is presented locally, with lea-way to innovate and mold to local requirements. Yesterday’s workshop was a very rewarding experience for me. Your devotion to the Safety Town Center and all that it stands for is quite an inspiration. I personally want to thank you for all your hard work and sacrifice that you have given to equipping children and parents to better live in a very unsafe world. The Center and the workshops should keep expanding to be a powerful force for child safety. The workshops have been very successful and extremely informative since 1971. They have benefited hundreds of people. I came home from the workshop feeling much more confident in teaching our program this summer. Very worthwhile program. Many new ideas presented. A definite need to establish programs throughout the country. Jct. 175 & Newtown Pike. Jct. 170 & 63 S.
Pacific Exc off Pasadena Fwy. HOLIDAY INN Exit University Ave.